Goodbye and Thank You, Claire Isitt! Goodbye and Thank You, Eamon Walsh! Goodbye and Thank You, Nancy Patton! 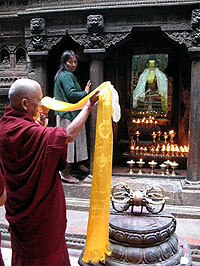 Rinpoche offering light and a khata at the 1,000 Buddha Temple in Patna, November 2008. “I think … the blazing fire destroying the Gompa is an auspicious sign – [a sign] that you have overcome all the problems by this blazing fire. [It] gives us the opportunity to build an Enlightened Gompa … a very beautiful Gompa that becomes an encouragement to everyone: to the depressed people, to the people who believe ‘I am helpless,’ to everyone, something which brings greatest joy and fulfillment in the heart. It is also a teaching to us on impermanence. Do not hold on to things which are impermanent, which are dependent arising, like the butter lamp depends on causes and conditions, like lightning, like a water bubble, like clouds, also like a star in the day time, like the defective view of the senses … an illusion, a dream – all this was said by Buddha. The fire, damaging though it was, brought an outpouring of support from the local community that is heartwarming and a cause to rejoice – read the account by ILTK’s Director, Laura Pellati, in Snippets. Enjoy brief glimpses of Rinpoche on our streaming videos page, including Rinpoche and other lamas doing puja in Aspen, Colorado! His Holiness, who had given a teaching on bodhichitta and the bodhisattva vows, also shared that whenever he thinks of Root Institute, he thinks of a garden of peace! 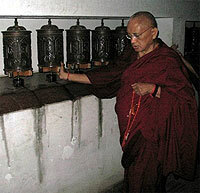 Lama Zopa Rinpoche spinning prayer wheels in total darkness at Swayambuth, Nepal, November 2008. As everyone knows, Claire Isitt has retired from her long tenure as Director of Center Services. In her nine years, Claire put guidelines and procedures in place clearly outlining how to start and run a center, and created a revised FPMT Handbook that provides inspiration and direction for all manner of needs that arise in a center. She dealt with uncountable issues and counseled more than you would want to count, all the while filling the Internet and airwaves with her wonderful laughter that all will remember so well! Heaps of praise and gratitude came in for Claire from members of the FPMT family for the excellent help and friendship she gave them before she flew home to sunny England at the end of December. While many worried that they would lose Claire and the wealth of knowledge and expertise that she had gathered, fear not! She will take a well-deserved but short break, before fully taking up her new duties as CPMT Coordinator. And if you have not already done so, this would be a good time to get registered for the event. Our most sincere thanks for all that Claire has given us, and will continue to give as our CPMT organizer! Outgoing too is FPMT’s Chief Financial Officer, Eamon Walsh. While Eamon’s reach may not have been quite as wide as Claire’s, neither International Office nor the numerous charitable projects could have survived without Eamon’s financial acumen. As all Center Directors know so well, he who is responsible for the finance is the pillar no project can do without. Eamon’s skills and support have been given generously and considerately. In fact, one would be hard-pressed to find a more gentle CFO! Our most sincere thanks to Eamon for all of his service! He too will continue to give in his new role as FPMT Online Education Coordinator. By mid-year, a good portion of the Discovering Buddhism program will be available entirely online, to be followed by Basic Program. Yeah! Our transitions this month extend still further. Nancy Patton, Mandala Editor-in-chief, has also retired. Nancy brought us forty beautifully crafted issues of Mandala over the last eight years. Her dynamic enthusiasm, professionalism, and unfaltering love for the magazine were an inspiration to us all and we are so pleased that she too has agreed to stay on board with us through April of 2009 to assist with the transition of a new editor. On behalf of all at International Office and the mandala at large, we thank Claire, Eamon, and Nancy for the invaluable contributions they have made to the organization. Doris Low (whom we introduced last month) has the huge challenge of following Claire’s footsteps as Director of FPMT Center Services. Jose Carlos Alarcon, who is FPMT’s new Chief Financial Officer, comes from Spain and has been director of Nagarjuna, Madrid and President of FPMT Spain 2002-2005. Carina Rumrill will serve as Mandala Editor. Carina served as Operations Director and Teacher Coordinator for Liberation Prison Project for the last four years. The last addition to our team is Ven. Joan Nicell, whose name many will know associated with our Masters Program. Joan has been the coordinator of both the Masters and Basic Programs at ILTK since 1998. Joan will continue in a lesser capacity as MP Coordinator while taking on in a larger capacity the daunting job of English Translation Coordinator. Her key initial tasks are to attend an international translation conference, and to work together with Translation and Editorial Committee to establish a standard glossary of terms. Light of the Path: PLEASE NOTE DATE CHANGE! The date of this two-week retreat with Rinpoche at Kadampa Center, USA has been changed to September 12-27, 2009. Discovering Buddhism: DB updates in German are now available in the FPMT Affiliates Area. French coming soon! Basic Program: The BP Updates page has been fully revamped and updated with a great deal of new English materials added. In addition, the page is now linked to two completely new pages with all currently available French and Spanish BP translations and materials. The update page is accessible from the FPMT Affiliates Area and available to center staff, BP teachers and students who have the BP CD 2006. Essential Buddhist Prayers, Volume 1 will be available in German at the end of January! Please contact Aryatara Institut for a copy. Heart Advice for Death and Dying, a commentary by Lama Zopa Rinpoche and audio course with guided meditations by Ven. Sangye Khadro, will be available in the Foundation Store January 19. An excellent resource for anyone offering care to the sick and dying, and for all who want to properly prepare for the only certainty in the life! On the advice of Lama Zopa Rinpoche, the FPMT’s Lama Chöpa has been revisited word for word by FPMT Translation and Editorial Committee member, Ven. Fedor Stracke. We will be making this final translation available soon in a new practice booklet that will include the Tibetan script. Many thanks to all who completed our Lama Chöpa survey. We had more than 150 responses! As decided by popular vote, all of Rinpoche’s advices have been kept within the text, while very significant layout changes have been made in order to make the root text easier to follow. A new FPMT Retreat Prayer Book has been compiled for all future retreats with Lama Zopa Rinpoche. This new retreat prayer book will be used at the Mani retreat in France, May 2009 and the Light of the Path retreat in USA, September 2009. The retreat prayer book, which will be translated into French and Spanish, contains: Preliminary Prayers (including Morning Activities, Mahayana Precepts, Daily Prayers, Thirty-Five Buddhas) Lama Chöpa/Jorchö, Food Offering Prayers, Prayers for Teaching Occasions, Praises to the Twenty-one Taras, Protector Prayers, Calling the Guru From Afar, Dedication Prayers and Long Life Prayers. NEW! Tuscan Summer Teachings DVD, six teachings from Lama Zopa Rinpoche given at Istituto Lama Tzong Khapa, Italy, July 2008. A total of eight hours of teachings on a single DVD! Please note that the six day SPC training, November 23-28, at Mahamudra Center in New Zealand has been postponed until 2010. New dates coming soon. Lama Zopa Rinpoche, Khen Rinpoche Lama Lhundrup, Ven. 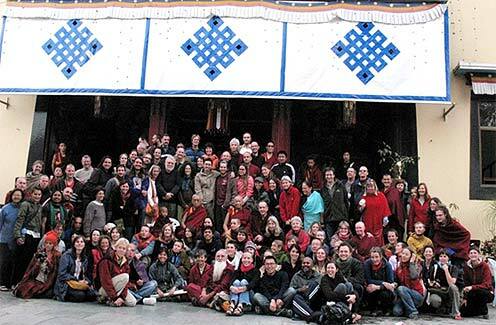 Thubten Dhondup and the 250 attendees of November Kopan Course, 2008. A pair of firefighters putting out the blaze that destroyed Istituto Lama Tzong Khapa’s gompa on the morning of Dec. 26, 2008. “What a great purification it was!!! 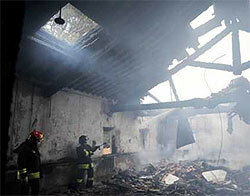 As you probably know, early on Thursday morning [December 26, 2008], a great fire broke out in the gompa. No one was injured but the gompa and its contents (thangkas, texts, statues, photographs, the lama’s throne, etc.) were completely destroyed and the roof collapsed. This is the sad and painful side of the story. On a more positive note, we were soon surrounded by the support and love of our teachers. Geshe Tenphel was here and within an hour Dagri Rinpoche arrived, soon followed by a phone call from Khensur Jampa Teckchog. All of them expressed the view that the fire was a great purification and a clear positive sign of future development for the Istituto. The event has somehow accelerated the process of renovation of the facility. The unexpected popularity reached by Istituto Lama Tzong Khapa, both nationally and internationally, the press coverage and the amazing word of mouth publicity amongst practitioners, sympathizers and interested people, are making us confident that now we will quickly collect the necessary resources. Locally, the mayor of Pomaia and mayors of other neighboring villages and the entire community living around the Istituto have come forward to show their support. This has given us the confirmation that the Istituto is in the hearts of the people – Buddhists and non-Buddhists, alike. Dagri Rinpoche added that the fire occurred on the 29th day of the lunar calendar and that the event should also be seen as a purification of all obstacles for the long life of His Holiness and the quick return of our beloved teacher, Geshe Jampa Gyatso. On a more practical level, the Christmas Course classes have been moved to our conference room and will commence as usual on Monday morning. The students who can no longer reside in the areas of the Istituto that have been declared temporarily off-limits will move to a nearby holiday resort which has offered accommodation at very low rates. Again, this is a clear sign of the support we are receiving from non-Buddhists. We obtained from the local town council the loan of a large hall that can accommodate up to 150 people [which can be used for the Masters Program, if necessary]. “ … We had just come from Ajanta Caves. Prior to that, we were in Nasik where Rinpoche had been invited to bless a new temple and land for the ‘new Buddhists’. These are mainly lower caste ‘untouchables’ who have converted from Hinduism to Buddhism to escape the caste system. The movement was started in the ‘50s by Dr. Ambedkar, himself a lower caste Hindu, who sought a solution to the caste system. He decided it was best to offer the lower caste an opportunity to convert to Buddhism. He took refuge, and the next day, gave refuge to 500,000 Indians in one ceremony. This happened at Nagpur, close to Nasik. So this area has many Buddhists and is noticeably more relaxed and peaceful. There is a lot of interest in Buddhist education and Rinpoche is very keen to help. Ven. Kabir is going to focus his attention there and teach in Hindi, and we will also have a geshe visiting regularly to give teachings in Hindi. We stopped to look at a Buddha statue in a park and when we had walked a little way on the grass, Rinpoche realized there were many tiny insects. He couldn’t move because he didn’t want to tread on the insects. We didn’t know what to do. In the end, we had to carefully fan above the grass so the insects would take flight as we slowly made our way, leading Rinpoche off the grass. Two-hundred and forty people from 33 countries came together at Kopan Monastery for a month of meditation, teachings, crowded accommodation and very early mornings! The most amazing part was their discipline, their harmony as a group, and their determination to make this month meaningful while opening their hearts to the messages of patience, tolerance and effort, up to the deep need for loving compassion and wisdom that is needed to liberate ourselves and others, and bring true happiness. The course had the largest ever age span of students. There was 60 years between its youngest participant, sixteen-year-old Felix from Melbourne, and Noel, also Australian, who had traveled to Asia to hear the Buddha’s teachings for the first time – at 76! The launch of Rinpoche’s latest publication, “How to Be Happy,” was a sell-out success. All 250 books were sold and there were many requests for more copies. Many people bought three, four, or five copies! It took Rinpoche more than four hours the first day to sign each book. First in line was six-year-old Tenzin Phuntsok Rinpoche, Geshe Lama Konchog’s reincarnation, who was later spotted reading the book in English to some of the geshes. Although Rinpoche didn’t finish signing all the books, it was an excellent way for each person in the course to come and meet and exchange some words with Rinpoche. A record $20,000 was offered towards the 2008 FPMT Long Life Puja for Lama Zopa Rinpoche, traditionally held after the Kopan Course each year. Rejoice! Rejoice! Rejoice! We’re pleased to announce a generous discount scheme from FPMT Bay Area that is sure to make everyone smile! Vajrapani Institute and Land of Medicine Buddha offer a 30% discount to all FPMT staff (anyone holding an official staff position paid or unpaid at the time of the retreat) of all FPMT centers, services, and projects worldwide. This discount is applied to accommodation and food only – course/teaching fees are by donation (amount left to the discretion of the individual). Accommodation discount applies only to shared accommodations (dormitory) or camping. Commuting students can attend all courses and events by donation only and get 30% off meals. Tse Chen Ling, Gyalwa Gyatso Buddhist Center and Machig Labdron Study Group (not being residential centers) will offer courses and events by donation only to all staff of all FPMT centers. Space permitting, Tse Chen Ling also allows any FPMT staff to crash (sleep on the floor) during teachings. Prior permission must be received from Tse Chen Ling’s staff. Vajrapani Institute sponsors all teachers of the FPMT Bay Area to attend its FPMT retreats free of charge. Offer applies towards shared accommodations (dorm) or camping only. They also offer them two free nights in a cabin for personal retreat. Tse Chen Ling/Buddhist Bookstore Café offers a 25% discount to all FPMT staff worldwide and all Sangha. Land of Medicine Buddha and Vajrapani Institute offer a 30% discount on bookstore items to Sangha. Official FPMT policy is that FPMT Center Directors receive 3 days free at any residential center.